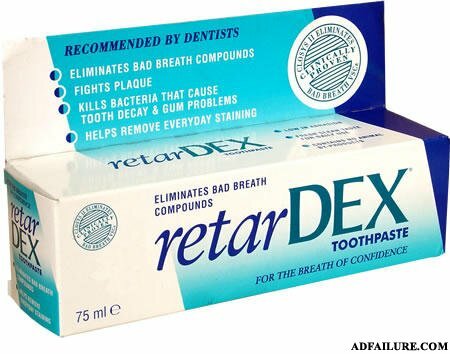 Toothpaste for the mentally challenged..
"Retard Ex, for those who aren't a retard anymore"
You will have fresh breath. Unfortunately, it still can't help that palsy look about you. Fights off cavities and retards! but what's really in the box... huh? Fights bad breath and plaque so well, Its Retarded! Oh, how I wish my retard can eliminates bad breath compounds, fights plaque, kills bacteria that cause tooth decay & gum problems and helps remove everyday staining too. For the breath of confidence, with a side of duhhherrrrrr.